A cat and a rabbit really can be friends. Yes, really. What seems an unlikely combination, given the predator-prey context that first comes to mind, is in fact a common and often rewarding match. The key is to remove that stereotype from your mind and, more importantly, from the environment. In an earlier issue we described some of the friendships that have developed between these two. Now we offer ideas on introducing cats and rabbits in ways that minimize stress for all concerned. A cat who lives with a house rabbit might still stalk and chase a rabbit he met outdoors. The environmental cues would set the instinct in motion. In fact, he might even pursue his own rabbit-friend if they encountered each other outdoors. There are two lessons here. The first is to make sure you set up a situation where Felix is unlikely to feel predatory. The second is that even if Daphne has a feline friend, she could still be terrorized by an unfamiliar cat. Many people report a total reversal of the expected roles between house-rabbit and house-cat. Daphne takes charge, bossing Felix, chasing him and generally throwing her weight around. Rabbits tend to be much more confrontational in social situations than are cats. I believe this is because, at a very basic level, rabbits are group animals and cats are solitary. Daphne’s instincts tell her, “Here’s someone in my territory. We need to figure out who’s who in the social hierarchy.” Felix, on the other hand, is thinking, “Hmm. A large furry creature who isn’t running away from me. Why look for trouble?” Fundamentally social or pack animals such as rabbits, dogs, and humans are much more concerned with hierarchy-with who’s in charge, who’s top dog-than animals who are programmed to live on their own. Domestication has modified these instincts in the cat to the point that most domestic cats prefer to live with at least one feline companion. And of course there is a great deal of individual variation within species, from the human hermit to the gregarious cat. There are also animals who seem to prefer the companionship of species other than their own. Many rabbits who lack the social skills necessary for living with another rabbit do much better with a feline companion. But what happens if the rabbit does run from the cat? Here’s where environmental manipulation (the human’s job) comes in. If Daphne runs, then the cat’s instincts tell him something very different than the laid-back, confrontation-avoiding stance he generally takes to social situations. Cats play only one game, and it’s called hunting. All that adorable behavior with the catnip mouse and the feather-at-the-end-of-a-string is basically Stalk, Capture, and Deliver the Fatal Bite.Probably the most difficult cat/rabbit introduction is between a shy and/or small rabbit and an adolescent cat whose claws haven’t been trimmed recently. In this or any situation where the cat chases, the initial acquaintance should take place with Daphne safely in her cage. Make sure that the wire is small enough that Felix can’t stick his foot through it. Also give Daphne a hiding place within the cage, such as a cardboard box (this is a good general policy for all rabbits, especially shy ones, even in catless homes). Actually, any cat who interacts with a rabbit, regardless of how friendly they are, should have his claws kept trimmed. Clip off the curved, sharp tip about once a month. Your veterinarian can show you how to do this. A mild swat from an untrimmed claw can give your bunny an undetected scratch that may later blossom into an abscess. When Daphne is in her cage, the two have a chance to get used to each other’s smell, sounds, movements, etc. A cage that’s large enough for the rabbit to do some dashing is ideal, as Felix will be able to observe rabbit aerobics and become accustomed to it. This phase may take days, weeks, or even months, depending on the animals’ personalities. Don’t rush things. It’s much better to go too slowly and succeed than to push it and stress Daphne or have to scold Felix. Scolding is the least effective method of feline education. It usually teaches the cat (a) wait till the humans are away and then torment the rabbit to your heart’s content or (b) rabbit=scolding, which is not a good way to begin a friendship. When you feel ready to move on, the next step is to give Daphne and Felix supervised access to each other. That means, hang out with them in a room where you can intervene if necessary, but don’t intervene unless absolutely necessary. Give them a chance to work things out in their own way. If Felix is mostly respectful and curious, let him sniff and investigate. If he’s rambunctious, squirt him with water a few times. Try not to let him know that it’s you doing the squirting, or he will associate it with you instead of with the behavior. The water should come as an unpleasant surprise, or, more technically, an environmental reprimand. If you find you’re resorting to the water-pistol frequently, that means you’ve moved ahead too soon. Go back to the cage phase. 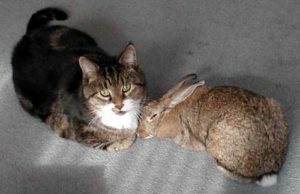 Eventually, most rabbits and cats get used to each other. It’s just a matter of time and, in some cases, supervision. This is by far the most common scenario. Cat and rabbit meet, indoors. Rabbit charges up to cat. Cat, non-plussed, backs off. The cat may even run from the rabbit. Most rabbits will chase only till they feel they’ve made their point. These two guys require no human intervention. Once Daphne feels she’s asserted herself to her satisfaction, she and Felix can become roommates, friends, or soulmates. If you’re introducing a new rabbit to a resident cat, you may need to give the rabbit time to establish a sense of territory in your home before she takes on Felix. It’s generally a good idea to confine a new animal, whether cat or rabbit, to a small area at first, either a cage or a single room. Change is stressful for rabbits as it is for humans. Arrival in a new home is more than enough stress for a rabbit. Don’t put her in the position of having to get used to new territory, new humans, and new cat all at once. Wait till she’s confident and comfortable. At our foster home we rescue both cats and rabbits. Over the years we have had the opportunity to observe many cat/rabbit introductions. By far the most important element you can contribute to this process is your intuition. Get to know your own cat and rabbit. Listen to what they tell you about their level of stress, when they’re ready for changes, whether they’re lonely, and so on. Let them set the timetable. This is the information that will allow you to shape the general guidelines given here to suit your situation. Creating a place where cats and rabbits can live together peaceably is a satisfying endeavor. It makes you think, if this predator can snuggle with this prey animal, maybe there’s hope for a compassionate world, after all. It’s a start, anyway.